Earlier today Google hosted an event that it called “The Next Dimension of Google Maps.” But the event wasn’t really about Google Maps, it was about Apple. Specifically, it’s about the fact that Apple is preparing to announce that it is dropping Google Maps from its Maps app in favor of a home-grown solution. This removes Google’s mapping product from the second most prolific smartphone platform on the market, the one where it makes a ton of money on advertising. Google’s announcement of the event last week for today was a clear response to Apple’s WWDC conference, which begins next week. Google wanted to get a word in about how great its maps are before Apple did its typically ace job of explaining just why its new app is ‘the best maps experience on any mobile device’ during the keynote on Monday. Unfortunately, the event was incredibly underwhelming for most of the people watching. Yes, there were some announcements, but they were mostly meager fare. 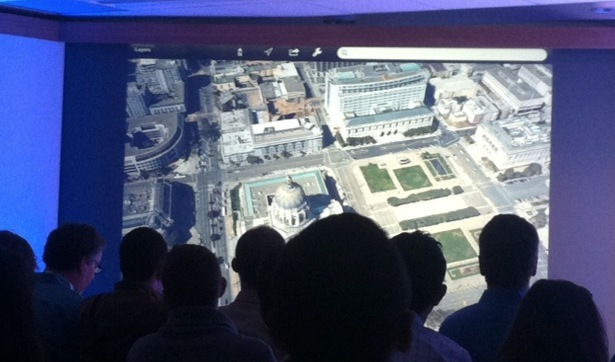 Google Earth getting 3D is cool, but it doesn’t really matter all that much in the grand scheme of things. Those cool 3D views need to be in Google’s regular map product, on Android and iOS, not in a casual-use tool like Google Earth. The Street View Trekker project, which uses backpack-mounted cameras to record new imagery for maps, is neat and it has the potential to save lives. But still, it’s a niche thing. The addition of offline support to Google Maps for Android was the only head-on product announcement today and is a genuinely cool feature for users. It stood out. When it was quizzed on whether it was worried whether Apple would create a better maps product, Google referred to the evolution of its maps over a ‘long set of years’ with many supporting services. There’s a lot going on in mapping right now and we wanted to be able to tell our story and cover more than just the new features. We’re very proud of how far we’ve come in terms of comprehensiveness accuracy and usability and we also wanted to share these innovations. There’s a lot going on in mapping, namely that Apple is going to kick us off of iOS next week. We wanted to focus on all of the history of Google Maps, rather than the future because we have basically nothing new to announce right now. Hopefully you’ll see our accomplishments as impossible for Apple to duplicate. Apple has yet to introduce its product. Google has nothing to compete against. So why the event today? It was an obvious attempt to hype up Google’s value as an incumbent in the mapping game. It wants you to feel uneasy about whatever Apple will announce, good or bad, because it hasn’t been doing this for a ‘long set of years’. Just like all of us, Google isn’t sure whether Apple’s offering will be fantastic or terrible. It could blow the doors off of the mapping industry or it could be a disaster. No one was really talking about how terrible Google’s maps were on the iPhone before rumors of Apple’s new mapping solution started getting hot and heavy. Apple is doing this to regain control of a key piece of iOS that it had given up to a partner early on. It wants to integrate Maps.app more deeply into iOS, it wants whatever data is being gathered via usage of the app to go to it and to improving its services, rather than Google’s. The advertising dollars from Maps. This is likely lower than the ad money coming from search, but it’s probably not insignificant. Google makes a ton of money on the iPhone. The deal to have maps on the iPhone was likely worth a tidy sum as well. The deal was renewed as recently as last year according to Google’s Eric Schmidt. No one knows the time period involved, but you can bet its running out about now. It was also previously tied deeply with the deal for Google to be the default search provider. The negotiations surrounding that will likely be much more interesting next round. The spigot of information gathered by users of Apple’s maps. Although the amount of info Google was getting was mitigated somewhat as Apple switched to its own mapping services, but the data is likely not insignificant. That’s really the biggest loss here for Google, that spigot of information. I’m not sure how much of Google’s advertising comes via Apple’s Maps app, but it’s probably not large. The deal to have Google Maps and Search on the iPhone as default, however, are entertwined deeply and worth a lot more. That deal also means that Google has known this day was coming for some time, yet today’s event displayed very little preparation and a lot of historical padding. They don’t have a standalone map app to parade out as an alternative choice, so all they’re doing is trying to sow doubt in advance of the announcement next week; doubt about Apple’s ability to deliver a decent mapping product without Google’s years of experience, doubt that it will be as accurate, as fast, as detailed. They trotted out stats, like the fact that its cars had driven over 5M unique miles in order to gather 20 petabytes of Google Street View data. And that it offers turn-by-turn directions in 187 countries with 26 M miles of driving directions mapped out. And that Google Earth has 1B monthly users. All in an effort to emphasize their expertise and minimize Apple’s. Google is self-aware enough about the possibility of Apple getting it right that it knew it needed to hold an event, but instead of fast-tracking a bunch maps features that it could show off as Android exclusives, it only had offline maps to show, a product that Michael DeGusta points out has been available on Android 2.1+ for a year now. What it adds up to is that, like us, Google is just holding its breath to see what Apple will introduce next week.